A couple of days ago I received a handful of Christmas cards in the mail, all originating from various parts of the U.S. on different dates in early December. I think the Italian post office accumulates foreign mail and delivers it once a month. Receiving the cards in retrospect made me reflect upon my Florentine Christmas, which although it was my third one since living in Italy, was the first one that I experienced fully. This Christmas season marked another big turning point for me in my new life in Italy. After 2 years of living in Florence, I decided it was time to settle more deeply into my home! I redecorated my Florentine flat with new furniture, linens, bed and appliances and started hunting for new art. Next, I would like to work with Rampini artisans to design a custom ceramic dinnerware pattern at their studio in Radda-in-Chianti to pay justice to the new Tuscan foods that I am learning and loving to prepare. At the same time, with the help of my family in the U.S., I parted wtih certain physical possessions that I had left in the States, such as my car and the last of my American furniture. Looks like I will be here a while, and it was becoming burdensome to manage physical possessions in another time zone. It was hard to let go of those things that were so dear to me, but I knew it would liberate me, and allow me to commit myself completely to my future life in Florence. I put the last finishing touches on my apartment just in time to jump right in to the Christmas spirit. 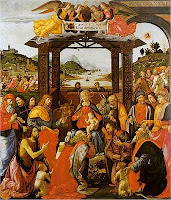 I fully participated in Florentine Christmas rituals, from the Feast of the Immaculate Conception through the Epiphany. I immersed myself in living, participating in, reading about and understanding better not only the Florentine, but the liturgical traditions that make Christmas season here so significant. I selected and arranged a presepe and started a collection of nativity figurines which I will build upon in years to come. It made me feel like a kid playing with a spiritual toy and evoked the essence of Christmas for me. I bought and trimmed a Charlie Brown tree in front of my Duomo view window. I also selfishly bought myself a gift this Christmas, something that I've wanted for a long time....a pair of opera glasses. Christmas was an exquisite season that unfolded through a non-stop progression of liturgical celebrations, adorations, patron saint feast days and local rituals expressed in the form of parades, Masses, costumed manifestations, art exhibits, fairs, concerts and through the traditional preparation of centuries-old Florentine peasant food. Rather than feeling like a singular secular holiday preceded by a wallet-busting shopping spree, Christmas felt like a live reinactment of liturgical and Florentine history. One couldn't possibly walk in the streets of Florence without feeling injected with a spiritual energy that emanated not only from the lights, the decorations and the glitter, but from the very heart of the culture of the community, combined with a very strong presence of the Church and a very supportive civic structure that proudly promoted the Florentine tradition. In addition to the many physical manifestations of Christmas that inspired me, I also found my favorite church, something that evolved over time, as I continuously felt drawn to this little spiritual oasis in the midst of the city. Santa Maria Assunta, known the world over as the chapel of the Badia Fiorentina, was the first Benedictine abbey built in 978 within the walls of Florence. Though rich in art, culture and architectural history, it is tiny and intimate inside and has a small local congregation. I am beginning to see the same people there at Thursday night and Saturday mass. The thing that really attracted me to this church was the heavenly singing of the Mass in Italian by the monks and the sweet, delicate chanting in quattro voce (4 levels of harmony) by the nuns and priests during their pre-Mass meditations, accompanied by a not-too-dominating organ. It is easy to understand why Dante fell in love with Beatrice within the inspirational walls of this church that has become my Monte Senario in the midst of the city. Being so close to my house, I stop in frequently even if just to genuflect and say a prayer or light a candle. Celebrating the unfolding of the Christmas liturgical season in my new church and getting to know the nuns who personally greet each mass participant, added another dimension to the meaning of "home" for me in Florence this Christmas season. This was the first Christmas that "The 12 days of Christmas" meant something more to me than just a song. The 12 days really do exist here, not in the secular sense of a partridge in a pear tree, but in the unfolding of the liturgical calendar from the birth of Christ through the Epiphany on January 6th. 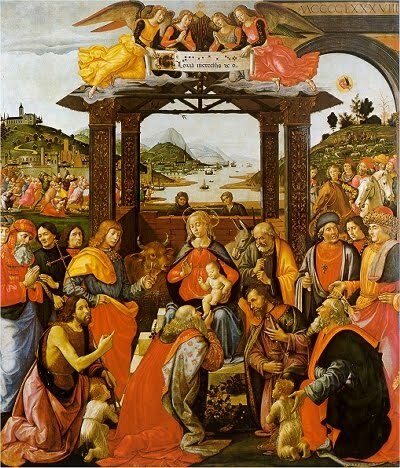 The Christmas festivities culminated in an elaborate finale on the 12th day of Christmas, the Epiphany (Coming of the Magi) which was manifested with more pomp and circumstance than Christmas. Whereas on Christmas day the streets were eerily empty and abandoned after church got out, on the Epiphany the city was alive and packed in spite of the rain. The Epiphany is a national holiday in Italy, and is an event that was venerated by the Medici who commissioned various frescoes that are housed in Florence's most stately palaces and museums, such as the one above, by Ghirlandaio. The highlight of the Epiphany was the manifestation of a spectacular ancient Florentine traditional parade in which the various comunes of Florence, adorned in elaborate Renaissance costumes, proudly displayed their banners and threw their flags as they marched through the streets of Florence, reinacting the arrival of the Magi, who trotted through the streets on their horses. The cavalcade started in Palazzo Pitti, crossed the Ponte Vecchio, winded through Piazza Signoria and arrived at Piazza Duomo, where choirs sang, the archbishop read the Gospel of Matthew, and little children presented their gifts of gold, myrrh and incense to the Christ child, who was a real-life actor in a live nativity scene, with donkeys and oxen. It is also the day in which the Befana, an old woman who rides on a broom, delivers gifts to children as Santa Claus does in the U.S. The Epiphany and thus the Christmas season literally culminated in a Big Bang, with the sounding of cannons , the chanting of the Alleluia and the release of balloons that flew straight up into the heavens above the Duomo. As I filmed the videos below which marked the end of the Christmas festivities, I felt a little sad to see it come to an end. I didn't want it to be over. But then I started thinking, that there's the Carnevale already coming up and they are already selling costumes and masks in the stores.....to be followed soon after by the unfolding of Lent and Easter. The last 2 years I was in the U.S. during Easter and missed it here in Florence, and so I am really anticipating celebrating it here for the first time. Living the liturgical year as vividly as it is lived in Florence, brings the community together in a very strong way and I am happy to be a part of it.